We gave our chart and article on the best guitar cases a complete overhaul, replacing some older models with some of the most popular cases around. This included adding the super-premium Levy’s Leathers LM18-BLK Gig Bag, the travel-proof Acoustic Flight Case from Gator Cases, and the very affordable Faswin Adjustable Acoustic Gig Bag. At both ends of the spectrum, if you buy either an expensive guitar or a starter pack, chances are it will arrive with a case, which is essential for both storing and transporting the instrument. However, the vast majority of guitars do not come with a bag of any sort. Thankfully, buying a case to suit your guitar isn’t as complicated as buying a guitar or an amp. Still, there are plenty of things to consider when purchasing a guitar case – whether that’s a hardshell case or a gig bag for an acoustic or an electric guitar. To help, we have put together a chart of some of our favorite cases on the market today, in all price ranges, as well as a short guide to finding a great match for your guitar. Let’s get started! The height of luxury in a soft leather gig bag! The best way to protect and transport any Strat or Tele. This hardshell TSA-approved case offers ultimate acoustic protection. A stylish gig bag offering protection from the elements. Great vintage style from this hardshell acoustic case. A basic case offering solid protection for any electric guitar. One of the best gig bags around – definitely the most stylish! A cheap and cheerful solution for any guitarist on the move. This uber-stylish gig bag for electric guitars will probably be overkill for many guitarists – especially with a hefty price tag – but it’s so beautiful and high-end, we couldn’t leave it out. The LM18-BLK is a real guitarist’s bag, featuring an exterior made of genuine black Texas tough leather, with 1” of foam padding and a plush lining. It is robust and durable, but sophisticated and very grown up. Other key features include two external accessory pockets, extra internal leather padding at the bridge and headstock, and heavy-duty cotton shoulder straps. Expensive, but awesome. If your precious axe is a Strat or a Tele, there is no better hardshell case to protect it on the road than this official Strat-Tele deluxe molded case from Fender. This case combines the sturdiness of a military-grade outer shell with a gentle plush polyester interior covering a protective foam cut specifically to fit a Tele or a Strat. Other features of this high-end case include a TSA-approved locking center latch, a padded interior storage section, and a comfortable handle. A robust and secure way to travel with your pride and joy. 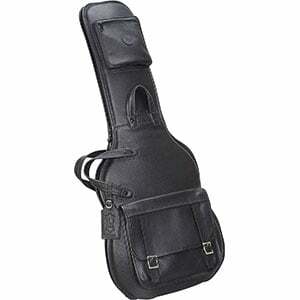 This premium acoustic guitar hardshell case from Gator is a smart choice for expensive guitars regularly on the move. 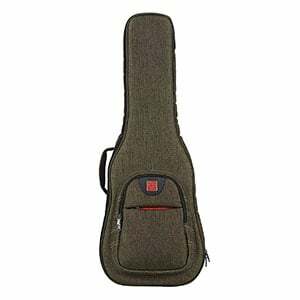 Although it’s quite pricey, this 41.5” long case provides exceptional protection for your guitar, holding the instrument snugly in place with a soft plush-covered poly-foam interior and a robust plastic shell. Other features include a TSA-approved locking system, internal accessory storage and an upgraded handle. It’s a lightweight and very well-balanced case, making travelling with a guitar a pleasure. Also available for classical, electric and bass guitars. This very attractive case from Music Area is a high-end gig bag worthy of a high-end electric guitar. Although it’s not cheap, it offers a lightweight solution which is designed to be waterproof, dustproof and very durable. This is down to the five-layer construction which starts with a protective polyester outer (in a very attractive dark green finish), while the interior includes a shock-absorbing polyurethane foam with extra neck padding and ultra-soft lining. It also includes two external pockets for a host of accessories and a very comfortable set of backpack straps. This hardshell acoustic case from Gearlux is a more wallet-friendly model than some of the other hard cases we have featured, coming in at well under $100. But it offers a very stylish and practical solution. In fact, it’s one of the best-looking hardshell cases around, with a retro yellow tweed-style finish complete with brown binding and handle, and gold locking hardware. Inside, the feeling of luxury continues with a plush lining to protect the guitar (it houses acoustics up to 44” long), as well as an internal storage pocket. While not as deluxe in feel as the Fender case above, this hardshell electric case from ChromaCast comes in at around fifty bucks and proves an impressive offering. It features a hard wood shell with black vinyl covering and a plush interior to offer good protection to any electric guitar (up to a length of 40.5”). Other features of the CC-EHC include an internal storage pocket, extra neck and bridge padding, chrome latches, a comfortable handle, and bumpers on the bottom and sides of the case. An inexpensive roadworthy solution for any travelling guitarist. Dollar for dollar, this seriously good-looking gig bag from Ibanez offers acoustic guitarists a relatively affordable case that looks a lot more than it costs. Available in either beige, black or burgundy (all with brown panels and detailing), the 541 PowerPad features a lightweight but durable outer layer with 15mm of padding around the bottom and sides. You will also find four conveniently-placed storage pockets, quality zippers, padded backpack-style shoulder straps, and an interior neck strap to keep the guitar from moving around. Houses an acoustic of up to 43” long. The definition of ‘cheap and cheerful’! Designed for full-size acoustic and classical guitars (with a maximum length of 41”), this ultra-affordable soft gig bag from Faswin is a very popular choice for beginners. At under $15, it’s hard to beat the value on offer. While there’s nothing luxurious about this gig bag, it is fundamentally very sound, with a durable outer and a soft padded lining to keep the guitar adequately protected. It also features a large front pocket for storing accessories and books, as well as backpack straps to carry it around. For both acoustic guitars and electric guitars you will usually find both gig bags (soft) and cases (hard). The style you go for will depend on your budget as well as your traveling habits. Let’s take a closer look. Gig bags can mean anything from the basic economy textile gig bags you find bundled in with beginner packs right up to premium all-leather soft cases that cost a few hundred dollars. In general, these softshell cases are the lighter and more affordable option. They also tend to come with backpack straps, which makes them a smart choice for travelling, as it leaves your hands free for other things (maybe carrying an amp). Unless you are using one of the aforementioned textile gig bags, which are usually nothing more than a plastic sheet, gig bags tend to be pretty well padded and resistant to the elements (some are even fully waterproof), although rarely are they as protective as a hardshell case. They also offer external pockets, which can hold accessories such as books and magazines, spare strings, capos, cables and even laptops. So, you don’t need to carry a separate backpack, as you can cram all your essentials into one gig bag. Ultimately, if you find you don’t travel much further than around your city, a gig bag is probably all you need. As the name suggests, a hardshell case is one with a hard exterior, usually made from plastic, wood or a lightweight metal. These cases are certainly heavier and bulkier than gig bags, but they offer maximum protection to your instrument. In general, if it is an acoustic hard case, it will tend to be cut to the shape of an acoustic guitar, while hardshell electric cases are traditionally oblong in shape. These cases will also offer accessory pockets, although they are inside the case as opposed to outside pockets. If you are checking a guitar onto a flight, it is necessary to have one of these hardshell cases as they will keep the guitar securely in place, while offering ample protection from baggage handlers, turbulence and baggage carousels. Some cases will even come with TSA-approved locks, which is a smart addition for modern air travel. Additionally, hardshell cases triumph when it comes to maintaining proper humidity. Hardshell models are far better at protecting a guitar from atmospheric elements, so – if you have an expensive solid-wood guitar – keeping it in a hardshell case with a good humidifier will do wonders for keeping it in optimum condition. The main purpose of a case is to protect the guitar when in transit or storage, so the main thing you should look for is how much padding it offers. Thankfully, unless you are buying a basic economy bag, most cases will come with at least 10 to 15mm of padding, which is ample to protect the guitar from minor bumps and knocks. However, unless the case features a hard shell, this padding probably won’t protect it from big falls. The outer material is equally as important, especially when determining whether or not it is waterproof. Most cases and gig bags will at least be water resistant, so if you are caught in a sudden shower your guitar won’t be damaged. But hardshell cases made of plastic or a vinyl-covered material offer the best protection from the elements. You will also want to ensure the case is well made, with strong handles and/or straps. There is no point in having a decent, waterproof bag if it is likely to drop off your back because the straps weren’t sown on strongly enough! Make sure that the instrument sits snugly inside the case. With some cases – especially soft gig bags – there is usually a little wiggle room, but you don’t want too much, otherwise the guitar will move around and become vulnerable to damage. Therefore, a strap to hold the neck in place inside the case is always a good addition. As we mentioned earlier, most cases will have at least one large pocket. Look for a case that will accommodate all your accessories, including cables, maintenance tools, plectrums, a tuner, a capo, batteries, a metronome and a strap. You can also find some cases with multiple pockets, including an easy-access pocket for a smartphone/wallet, which is always handy. Finally, if you are buying a hard case in particular, make sure it will fit your guitar. Whereas gig bags tend to be more universal, hardshell cases mostly fit a specific size or shape. So, if you have a Les Paul, you will probably need a different hard case to your pal who owns a Strat. Of course, there are some universal hardshell cases, but be sure to do your research before buying! Now you know what to look out for, how much should you actually spend on a guitar case? As we have seen, a very good padded gig bag can be picked up for under $20, a decent hardshell case can be found for around $50, while higher-end cases can reach up to $300 plus. While the final amount you spend will be largely down to your budget, you should look at the case in relation to what you have spent on the guitar. If you have just bought your first guitar for under $200, chances are a $20 case will suit it just fine. However, if you have just splurged $5,000 on a high-end masterpiece, you would be sensible to invest another few hundred on a good case to help protect it from the elements and damage while travelling or in storage. While buying a case isn’t a risky purchase, it is still worth spending some time reading reviews and – if possible – trying out the case for yourself to ensure it fits your instrument and offers you the features you need from a bag. We hope you have enjoyed this article and have been inspired by the awesome models in our chart – maybe even found your perfect match!